This was a delicious pasta – a takeoff on this one from Epicurious, a favorite of R&E’s, but changed a bit due to ingredients on hand plus a whim or two. Also, this is written for two servings, not 8. The tiles on the island are 4″ across. Cut in two the long way, then slice into 1/16″ or so (thin!) slices, one Molinari Piccolino Pepperoni (about 1.7 oz and $1.75 at Market Hall on Fourth St – a lucky impulse buy on the 18th. These are individually wrapped and placed next to the cash register!). Clean, dry, and prep about 1 1/4 oz (after stemming/trimming) arugula. 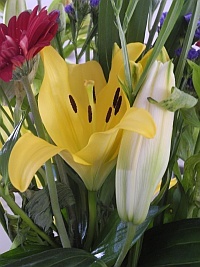 Tear or cut into moderate pieces. Measure about 1/8 cup oil-packed, sun-dried tomatoes. Cut into 1/4″ or smaller pieces. Collect the oil that drips off them so you can use it later. Cut up 1/4 of a small onion, whatever that means. I think I used a red one. Finely chop one moderate garlic clove. Collect the dripped oil from the sundried tomatoes, and add enough olive oil to make about 2 Tbsp total. Or you can use less than that. Heat over moderate heat in a 10″ frying pan. Add the pepperoni, onion, and garlic, and 1/16 tsp (one Pinch) each of salt and pepper, and cook till the onion is soft and lightly browned, abut 8 minutes. Add the sundried tomatoes and cook another 2-3 minutes. Remove from heat, add the arugula and stir till just wilted, about 1 minute. A couple minutes before the penne is done, spoon excess boiling water from the penne pot into the serving bowls to warm them. Drain the penne, and stir into the topping mix, adding a bit of the penne water (which is conveniently saved in the serving bowls, which you should now empty) to the mixture, stir in the basil, and serve. 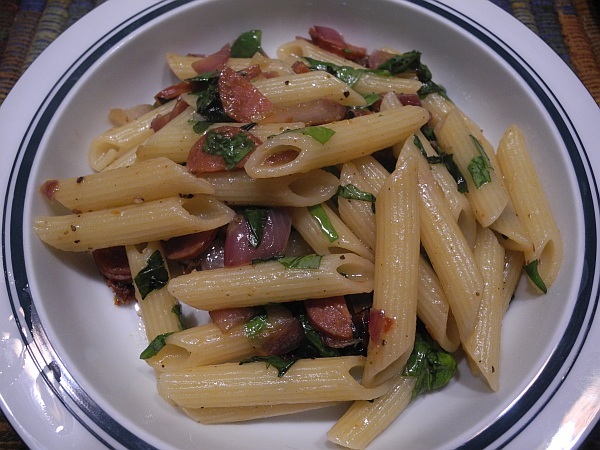 I decided the cream in the original recipe would be disjunctive with the pepperoni – may be true or not, but I didn’t miss it at all – and also that I often find parmaggiano not to enhance the pasta it is added to, so I skipped it. And I really loved this! The tiny Molinari pepperoni was the main flavor, but everything went together very well. So I see I gave up on cooking a veggie to go with this and just had some cold ones on the side – a carrot and a couple of radishes. Good stuff, anyhow. 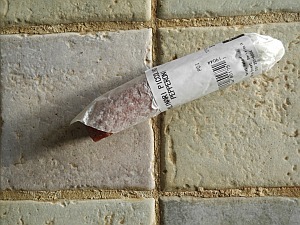 Probably defrosted the baguette piece, which looks like a sweet Acme. 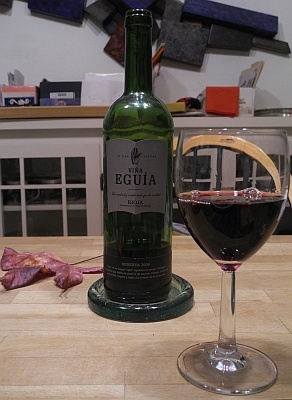 I brought up an Equia Rioja, a wine I like more than D does, since he was not here for this dinner. (I made two servings so I would have leftovers – this was only moderately successful, as the penne were tough when I microwaved them. Reheat in a pan instead?) 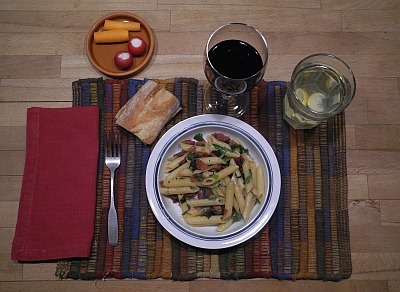 Anyway, the wine went fine with the pasta, I thought. 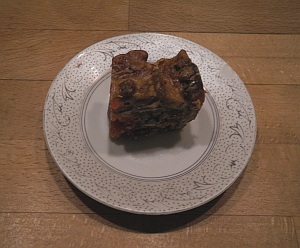 Later, I had a chunk of fruitcake for dessert. 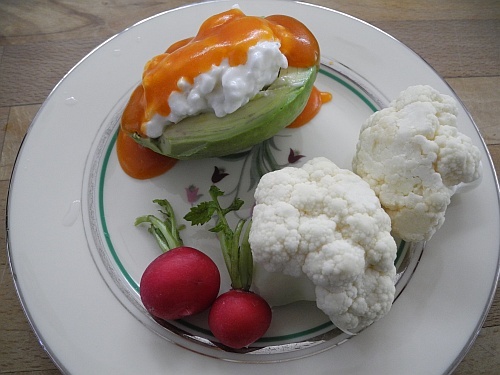 This was probably the second half of a avocado I opened yesterday, to make the same dish: avocado topped with cottage cheese and VJ’s French dressing (oil, ketchup, sugar, Worcestershipre, etc.) I wasn’t any more ambitious at lunch than at dinner (clearly, I expected to cook up some hot veggie for dinner, but didn’t get around to it) so just had a couple of radishes and some cauliflower. D previously discovered that the cauliflower is delicious dipped in this dressing, so likely I had dressing on this one. With VJ’s permission, I will add this recipe to my associated recipe blog. Later I wanted dessert for some reason, and decided a few crackers with jelly would do the trick. 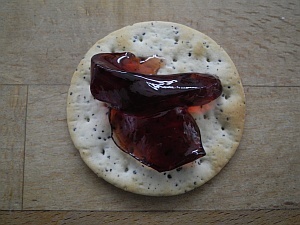 This is Bonne Maman redcurrant jam on a Monet cracker of some kind. This entry was posted in Pasta, Sausage and tagged Arugula, Avocado, Basil, Carrots, cauliflower, Cold veggies, Cottage cheese, French dressing, Garlic, Lunch, Onions, Pasta, penne, Pepperoni, Radishes, Sausage, sundried tomatoes. Bookmark the permalink.